Description: This is the third panel of a Celtic version of Sleeping Beauty. At first, I had thought "The Journey" was about overcoming obstacles and hardship, but it's not. It's about grace. 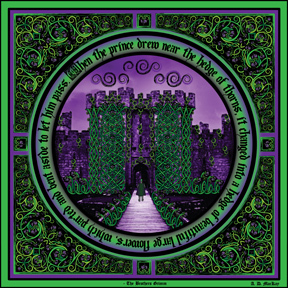 Although the Prince has travelled long and far to reach the Castle and the sleeping Princess that is hidden within, as he approaches what appears to be the most difficult obstacle along his way, the cursed hedge of thorns and brambles that has enveloped the Castle, the thorns turn into flowers and the hedge parts to allow him to pass. Sometimes, when the right person, time, and place all come together, any obstacle can be overcome, not through force, but through the magic of synchronicity. And so being the right person at the right place at the right time, the Prince, with no weapon drawn, enters the Castle with ease.